What's going wrong with your resume? This is a guest post by Dan Keller. Are you struggling to get interviews and land that job? Your resume may be the culprit. The competition for most jobs is fierce and recruiters are overwhelmed by the amount of resumes they receive for job openings. If your resume does not shine, chances are you will be passed over. Here are five areas where your resume may be falling short. You have about 20 seconds to grab your readers attention and hook them into reading more. It is not uncommon for recruiters to look through several hundred resumes for just one job posting. With the odds stacked up against you, it is vital that your resume create impact and make a great first impression. An employer wants to quickly find out why they should invite you an for an interview. If you are not providing this information in a clear and compelling manner, they will simply move on the next resume. The visual layout and appearance of your resume is just as important as the content. Be sure to use an appropriate format with well-defined sections that allow for the reader to quickly find the information they are seeking. 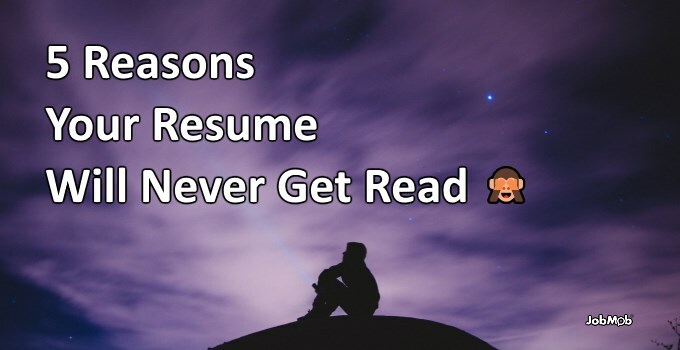 There is no set rule about the length of your resume but conventional wisdom suggests that if you are a recent grad or entry level job seeker, you should have a one page resume. If you have been working for over 5 years, then a two page resume will probably make sense. You want to make sure to include as much relevant information to convey your experience in a way that demonstrates your fit for the position. Keep in mind your resume is not your life story, if you find yourself going past page three you will want to look for ways to pare it down. Remember, you have about 20 seconds to make your impression. Your resume accomplishments section is your chance to shine and really connect with the employer. Companies are looking for the best of the best and this section will tell the employer why you should be the one they hire. Many job seekers have a difficult time pointing to significant achievements, so here are some questions to ask yourself. What policies or procedures have you devised? Have you been selected to train other employees? What have you changed or improved anything? Have you exceeded your goals? Have you received recognition from management or peers? Over half of all resumes are said to contain at least one error (!). When recruiters are looking to screen out resumes, an error or typo can make all the difference. The impression that errors in resumes make is that you are a careless person and do not possess the attention to detail that is required in many positions. Be sure to read your resume several times, run it through a spell checker and then have at least two other people read it over as well. It is also wise to print out a copy of your resume as you may pick out mistakes that you may have missed while reading it on your computer screen. Dan Keller is an experienced recruiter, resume writer, author and blogger. For more resume tips be sure to visit his blog CareerCopilot.com and follow him on Twitter @careerblogger. Subscribe to JobMob via RSS or email and follow me on Twitter for more ideas on how to rethink your resume. Nothing is as underwhelming as a poorly-written resume. There is no excuse for spelling errors. Unfortunately, so many students are never taught how to write a proper resume. It all leads back to communication! In section 3, it should be “pare” it down, not “pair” it down. Unfortunately, comments aren’t open there so I can’t suggest the correction like you did.